Native to Sri Lanka, and southern India, cinnamon is a beautiful evergreen tree growing to 10 metres or more, with a bushy canopy of glossy, ovate-lanceolate 7cm long leaves. Tiny, creamcoloured flowers form in clusters on the end of stems, followed by small, brown seed capsules with one brown, oval seed. All new growth on the tree is a vivid, vibrant red, which makes the tree quite stunning in appearance several times a year. 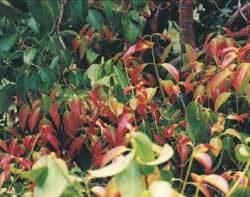 The red leaves, called a flush, mature into bright green leaves, which are fragrant when crushed. Cinnamon has a long history of use. Early Egyptians used cinnamon in their embalming mixtures. There appears to be secrecy around the early sources of this tasty spice, possibly because the early traders did not want to reveal their source. Cinnamon was regarded as something to be treasured and sold for extremely high prices. Adventurous explorers and sea traders were lured to seek out this unique, delicious fragrance and flavouring. Cinnamon not only delights the taste buds, but benefits other parts of our body as well. It is one of the world’s oldest healers. Recent research studies show that cinnamon contains constituents that can kill bacteria and other micro-organisms, including Staphylococcus aureus, the source of golden staph infections, and Clostridium botulinum, the source of botulism. Cinnamon has also been found to destroy Aspergiilus parasiticus and A. fluvus, fungi that produce aflotoxins, which are poisonous and carcinogenic. In the kitchen, cinnamon is a most enticing spice and the flavour is so pleasing to the palate. My mother was a superb cook and one of her specialties was cinnamon buns, made with a yeast dough mixture, spread with cinnamon and sugar, then rolled up and baked. The aroma in the kitchen when they were baking was delightful and eating them was a real treat. To have a cinnamon tree growing and be able to walk into my garden, pick the brown twigs and chew on the end to taste that sweet cinnamon flavour is something I really appreciate. Often, I will brew a very refreshing tea of fresh cinnamon leaves, fresh alfalfa leaves, slivers of and fresh ginger and orange peel. In Chinese medicine, the rind of citrus is specifically useful to treat colds and diseases associated with mucus discharge.